Voting closed last Thursday in the contest to determine what this year's bling will look like for Rock 'n' Roll New Orleans Marathon & 1/2 Marathon finishers. Did you let your voice be heard in time? Did the design you liked the most get picked to hang around thousands of finishers' necks come January 25, 2015? The wait is over, and now's when you get to find out! Voting was close in the contest, but the winning design that edged out the others was done by Kyler Wilson. His circular layout features a bead border surrounding the race name, the date, and distance along with a silhouette of Louisiana, an iconic New Orleans street lamp, and wrought iron embellishments. 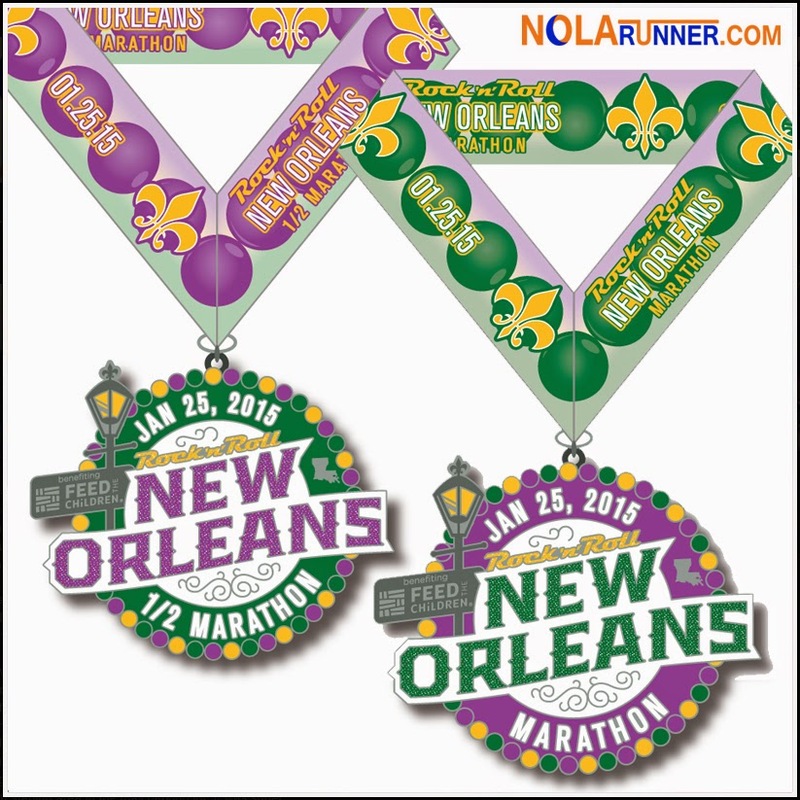 Each element on the medal captures New Orleans well, and I personally am thrilled with the chosen design! I can't wait to earn mine after running 26.2 in just a few months. Click on the image above to see larger versions of the final winning design in each race distance, and commit now to earn yours as you cross the finish line at City Park. Also announced was a new charity partner for the race, as it's being called the The Rock 'n' Roll New Orleans Marathon & 1/2 Marathon benefiting Feed The Children. Feed the Children works to create a world where no child goes to bed hungry. They distributed more than $344 million worth of food, essentials, education supplies, and medicine to more than 10 million individuals last year alone. Through Team Feed the Children, runners of the Rock 'n' Roll New Orleans Marathon and 1/2 Marathon can dedicate their event training and race participation to make a lasting change in the lives of children in the New Orleans community. Find out more info about Team Feed the Children and how you can raise funds for their cause HERE. What do you think of the medal that's been selected, and which one are you going to earn? Registration for Rock 'n' Roll New Orleans is now available by clicking HERE. New Orleans native & sports marketing professional with a penchant for everything that makes his hometown unique.